I’m one of those people who are often unsatisfied with the quality of components in my games. There is nothing more frustrating than spending your hard-earned money on something that just feels inferior. I feel this way about most any product, not just games. I do believe the old adage of “you get what you pay for” is accurate, but I subscribe to the “I want to get at least what I paid for”. I’m not ashamed to admit I sometimes take it upon myself to upgrade something I don’t think is working correctly or is of substandard quality. I currently have a disassembled shower head on my work bench (a story for later) and recently re-soldered my daughter’s cell phone doll accessory. Of course I used better quality wires and so much solder that it’ll outlast both her and I. Board games haven’t escaped my attention either. A lot of time was spent upgrading the currency in our copy of Coal Baron, mostly hunting down hi-res scans of actual vintage German currency. We also restored and polished our thrift store find, Crossfire. But my attempts at improving what talented designers create doesn’t always go as smoothly as I’d like. Such is the case when I tried to add some extra zest to our copy of Super Mario Level Up! by USAopoly. First, a little about the original game. 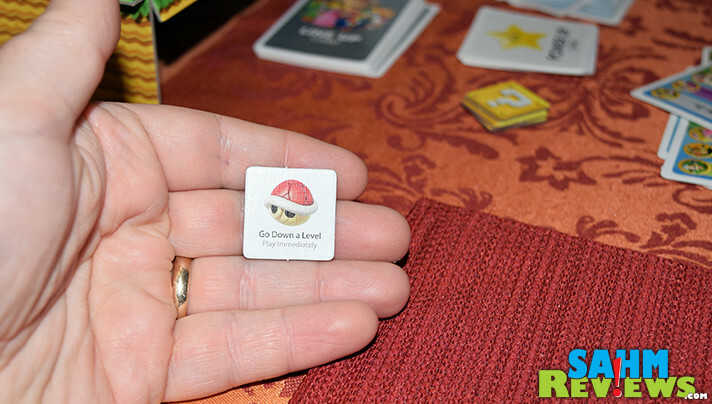 We excitedly picked up a copy at this year’s Gen Con convention solely because of the Super Mario theme. Mario has been around for so long that its popularity bridges generations. I played the original version on my NES while both my girls adore him on their WiiU and 3DS systems. 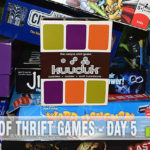 The possibility of playing a board game that had a theme the entire family loved made it an instant-get. Super Mario Level Up! bills itself as a strategy game, but we found it to be more accurately described as a push-your-luck title. 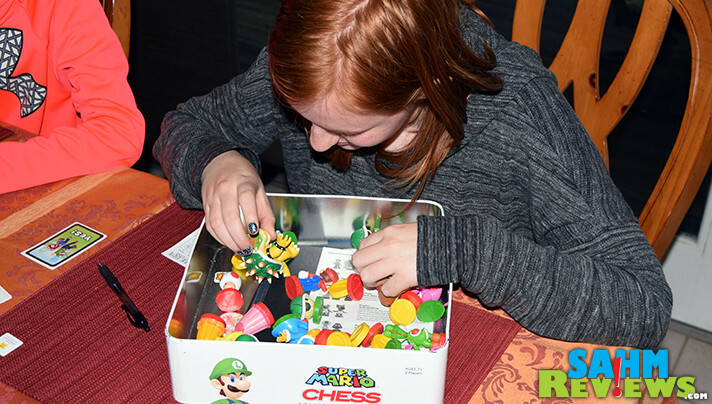 The box includes a 3-D game board (assembly required), thirteen cardboard characters with standees, voting and power up cards as well as a handful of question mark blocks. Much like the mechanic of racing game Downforce, you’re not trying to be the first to the top or anything like that. At the beginning of each game you are given a line up card which determines which characters you are trying to level up for that round. 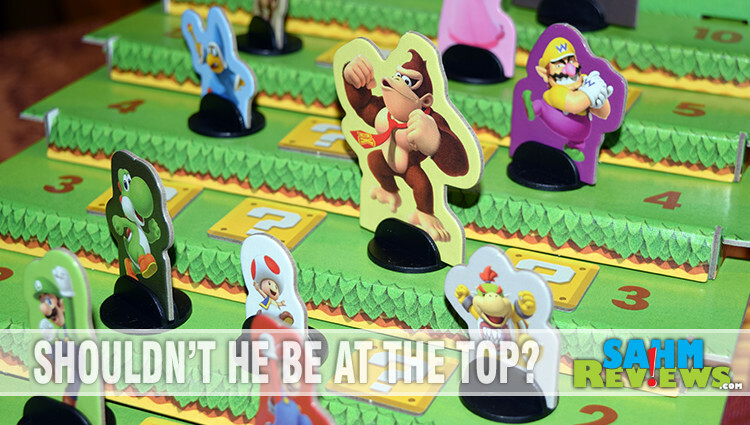 So while your favorite may be Mario, to win Super Mario Level Up! you might have to help out his nemesis, Bowser. 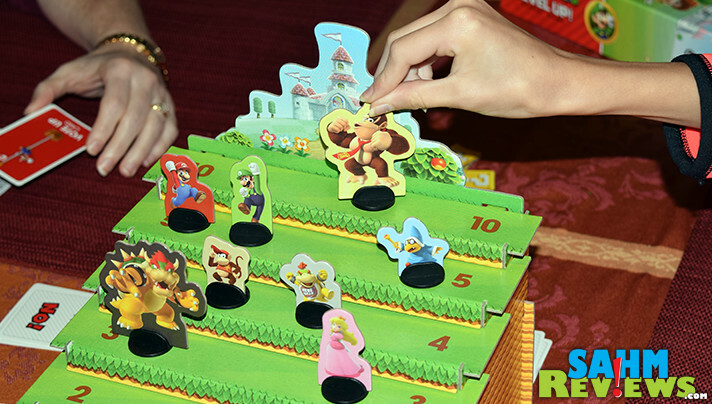 To set up the game, each player gets to place two characters anywhere on the board. While you want the characters on your line up card to end the game as high as possible, this is secret information. If you put your characters way at the top you might give away your strategy and become a target of the other players. Once all of the characters have been placed, any empty spots on the board on levels 1-5 are populated with blocks, making a total of four blocks/characters per level. 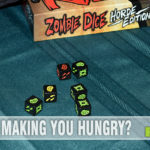 Starting with a randomly chosen first player, on your turn you simply choose any character to move up one level (as long as there are less than four characters on that new level). Characters may not be moved down a level unless instructed to do so by a block. If you move to a level that has a block available, turn it over and follow its instructions right away. That’s all there is to a turn! Some revealed blocks allow the current player to draw a power up card. This card has special powers that are kept secret until played and can only be used once. If a character reaches level 10 on the board, then play immediately stops and players vote to decide whether or not to elect that character as champion. 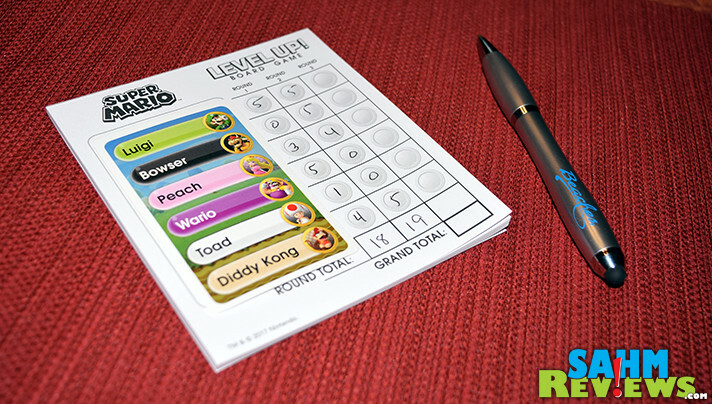 Electing the champion ends the round immediately and begins the scoring phase of Super Mario Level Up!. Players choose either “Yes” or “No” via their voting cards and lay them face-down in front of them. As long as there is at least one “No” vote, no champion is elected. That character is removed from the board until the next round. If the champion was elected, all players receive points for the level of each character on their line up card, along with any bonus points awarded by coin blocks. 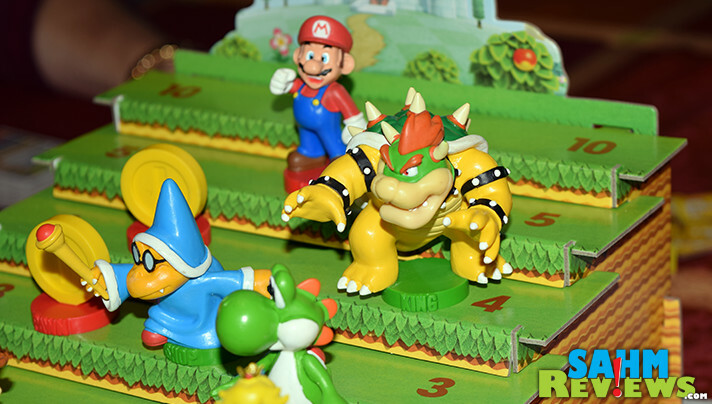 A total of three rounds are played for a full game of Super Mario Level Up!, with the player with the highest overall total winning. Super Mario Level Up! 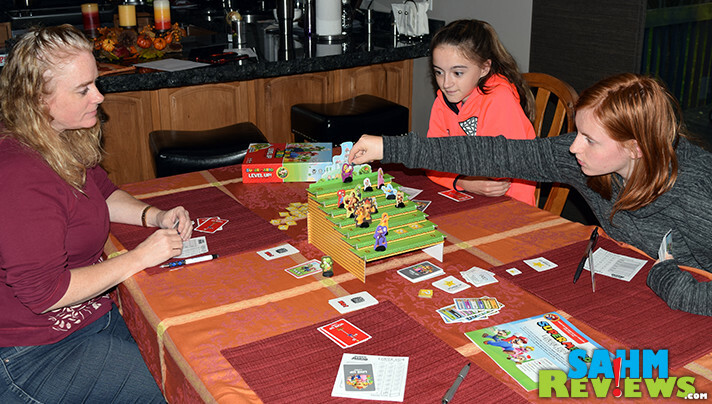 is one of those games that is super-easy to explain to all ages, but because of the strategy and push-your-luck mechanic, is a game that puts everyone on the same level (pun intended). Do you vote in a champion even though your other characters are still a low level? Do you force a “No” vote so that character is available to no one? You won’t know if you made the right choice until the end of the round! 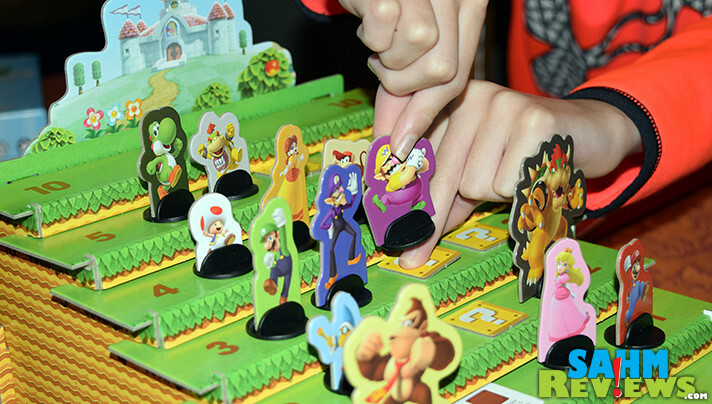 But those cardboard standees… Sure, they keep the manufacturing costs down, but we’re now used to the 3-D Mario from current WiiU titles. Just last week we happened across a copy of Super Mario Chess Collector’s Edition at our local Goodwill. 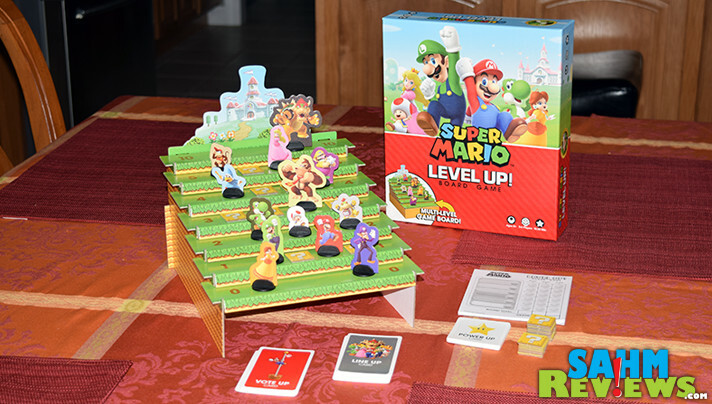 Also by USAopoly, I thought it would be the perfect way to upgrade our copy of Super Mario Level Up! by scavenging the beautiful vinyl characters from the chess game. I should have done my research first. It set me back $3.88 and turns out to be missing a piece (Bowser Jr.). Plus there aren’t enough different characters to completely replace all thirteen found in Super Mario Level Up!. It was such a great idea, just poor execution on my part. I can only hope they eventually publish a deluxe version of Level Up! which includes 3-D versions of all thirteen! Don’t let the 2-D standees deter you, Super Mario Level Up! 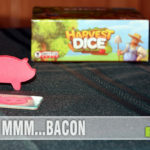 will make a fantastic title for your family game night. 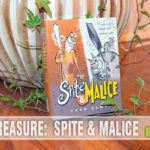 Find your copy on Amazon for under $20. 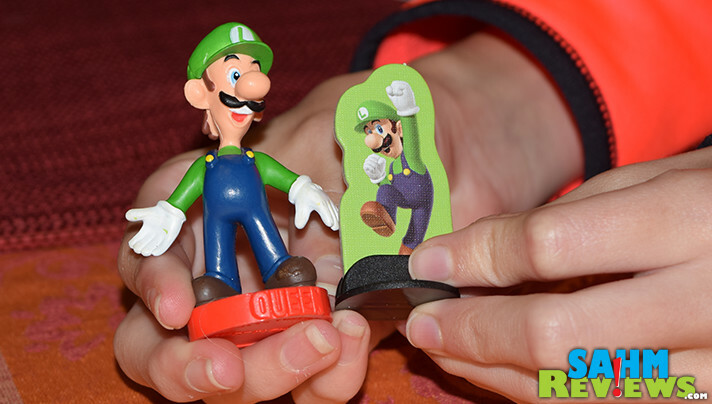 As you have seen, USAopoly has a number of Super Mario-themed games in their catalog, so be sure you are following them on Facebook and Twitter to find out when the next one will be issued! Ha – love the “super Mario level up” reference! Thanks for sharing your tips – great ideas! Don’t you hate when you have a great idea but the execution doesn’t quite live up! The game still looks and sounds super fun to play as a family! You’re right, Heather! I hate it when I have a grand idea then it flops. That’s why Scott does most of the cooking. LOL! As for the game, it really is a lot of fun! We recently started camping and one thing we love to do in the evening is play games. This sure looks like a perfect game for our trips. My son especially will love it. I hate feeling like I have to upgrade something I’ve bought because the quality isn’t good enough. Sometimes it can definitely be worth it though to take the time to improve something. That game looks like a huge amount of fun! I am willing to bet it totally changes game night. Ha ha, I subscribe to the “I want to get at least what I paid for” addage too! It does look like a fun game. Well, that’s a really fun way to play Mario minus the screen! I need to pick up a game set fr the family! Games like this make me so nostalgic for playing Mario with my brother on the N64. Sounds like a super fun game. Sorry that your upgrade didn’t work out. I need to get this for my son (as it is from his era) to play with his son! This game is a lot of fun to play, but be warned; you really need a sturdy surface to play on or you will constantly have to keep putting pieces back up. Though, to be fair, when we played the table was sturdy…it was just the cat being a jerk. This game looks like so much fun my nephew would love it. Thank you for all the great tips and honest information. I love your reviews and posts.